It may take half a year to identify the victims’ remains. U.S. 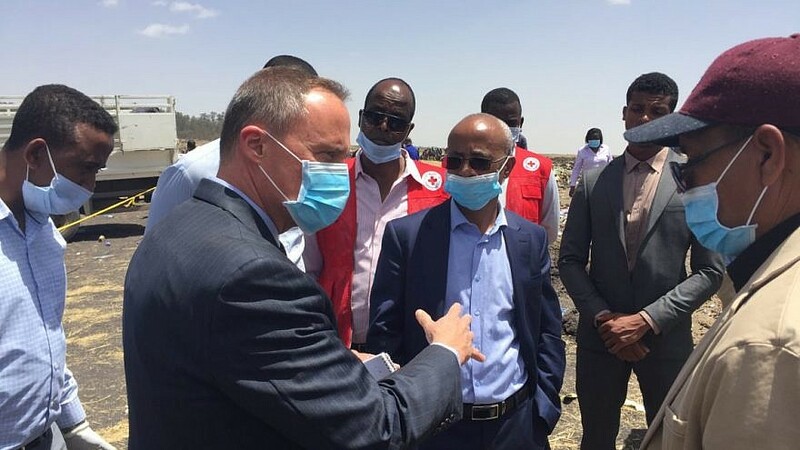 Ambassador Mike Raynor from the U.S. Embassy in Ethiopia at the crash site of Ethiopian Airlines Flight 302 on March 10, 2019. A team of experts from the U.S. National Transportation Safety Board and the Federal Aviation Administration arrived in Ethiopia to help with the investigatio, as have a forensics team from Israel to search for the remains of two Israelis who died in the crash. Credit: U.S. Embassy in Ethiopia. (March 18, 2019 / JNS) A forensics team from the Israel Police arrived on Monday in Ethiopia to assist local authorities in identifying the remains of two Israelis who were killed alongside the 155 other passengers onboard Ethiopian Airlines Flight 302, which crashed to the ground shortly after takeoff on March 10. Reportedly, it may take half a year to identify the victims’ remains. The Israelis identified were Avraham Matzliah, 49, of Ma’ale Adumim and Shimon Re’em, 55, of Zichron Ya’akov. A ZAKA emergency response group sent volunteers to Ethiopia just hours after the crash to identify and repatriate the remains of Re’em and Matzliah so they could be afforded a proper burial by their families back in Israel. A family friend of the Matzliah family, Shimon Misha, told AFP that he flew to Ethiopia to help locate the remains of his friend, but was prevented by investigators. He was allowed, however, to conduct a search for Matzliah’s tefillin.